Fig. 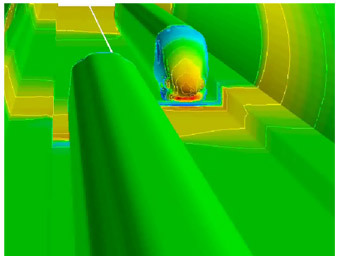 1 Pressure distribution on the train surface and tunnel wall. Fig. 2 Time history of pressure gradient in the tunnel. Fig. 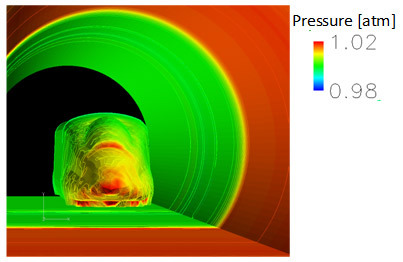 3　Pressure distribution of trains surface and tunnel wall. Fig. 4 Time history of pressure in the tunnel. (1) 小澤智，”高速列車の空気力学的諸問題”，ながれ，Vol. 21 (2002), pp. 346-353. (4) 阿部行伸，森田潔，寺島修，"圧縮性流体解析を用いたトンネル微気圧波解析",機械学会年次大会講演論文集：JSME annual meeting 2009(2), 157-158,2009. 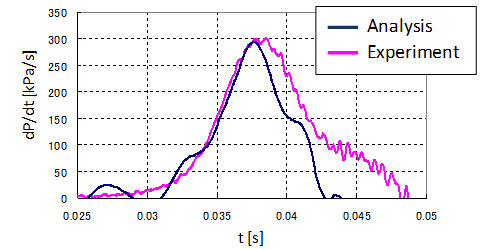 (5) K.MORITA, Y.ABE and Y.TAKANO, "Micro-pressure Wave Calculation Using Three Dimensional Compressive Fluid Analysis", Noise and Vibration Mitigation for Rail Trans. 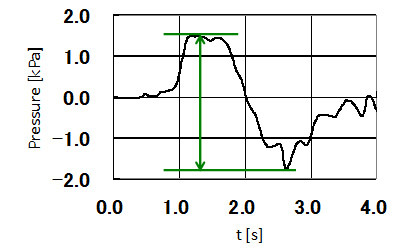 Sys., NNFM 118, pp.409-414.